Our sensorhub is a extension firmware which can be loaded on a NEO (VBasic would be ok) and enabled in the System. The needed Firmware will be enabled by our service - so please contact us by mail. 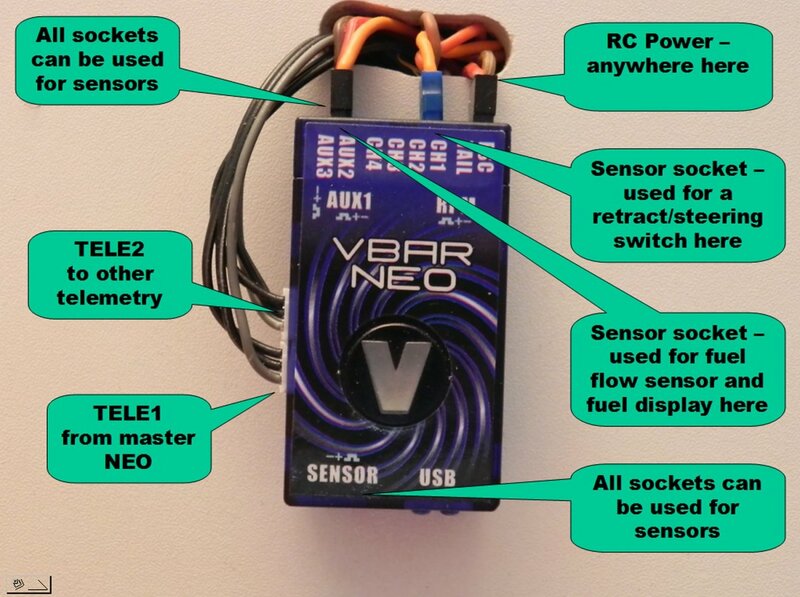 The used NEO must be either a non-VLink or a VLink form the 2nd generation (see VLink Upgrade page on NEO section). The receiver part inside the NEO is non-functionally with this Firmware. First load the hub firmware on a NEO and connect TELE1 of this unit with the flight NEO or other telemetry device. TELE2 can be used to chain other telemetry devices as usual. Conect the hub to rc power at one of the pinheader sockets (except Sensor). After loading the regarding app to VBC it should be shown in the menues there. Using a hub as Fuelmeter with a flow sensor - proceed with predefined panels in the link at the bottom here. In the setup menue a physical input and a driver mode can be assigned to the output channels. The channels from our hub can be used as input for MC (#110-#118) to control things based on the sensor hub or set outputs in the hub based on makrocells.